First off, I know that you are sick of hearing me whine about how much I want Caroline’s shelf. Caroline is a friend of mine, and her home was featured here. But look at it. Isn’t it beautiful? I just wanted the shelf and wasn’t even looking at the white ironstone. She had mentioned that she wanted to get rid of it, but when I said I wanted to buy it, she decided that maybe she should keep it. 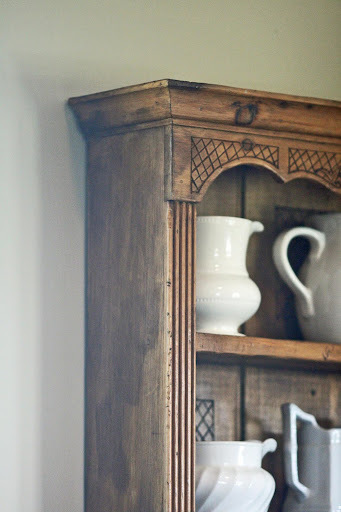 Hmmm… The more I thought about her shelf, the more I thought that I liked the ironstone too. 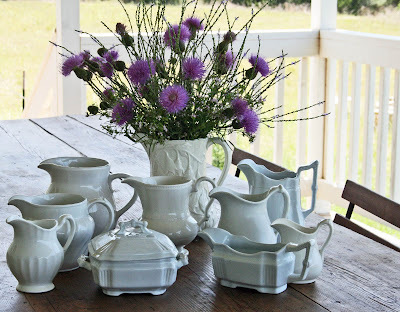 I bought a piece at Leftovers (click here) and fell in love with white ironstone. I loved the look so much, that I bought some more on eBay, click here. 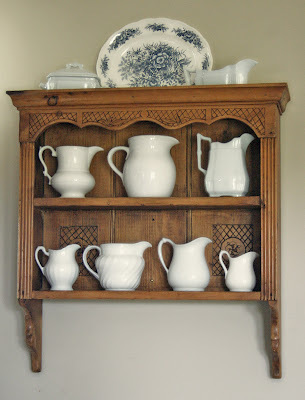 So now I had some wonderful English ironstone, but still didn’t have Caroline’s shelf. I used what I had. I looked OKAY, I guess, but still I couldn’t get “THE SHELF” out of my mind. Then when shopping at a resale shop, I saw this. Well, actually Peggy pointed it out to me. It is smaller than Caroline’s shelf, but fits in my space better, and it is pine which is what I wanted. I called Caroline to let her know that I found a shelf. I mentioned that I might paint it with the Annie Sloan paint and she yelled, “WHAT?!!? ?” Perhaps she was a little annoyed since she talked about painting her shelf and I strictly forbid her from doing so. (Yes, I have that kind of power over people… well not usually.) You can read about it here. I relented. She was right. I just kept thinking of how wonderful it would look with the Annie Sloan paint and wax. 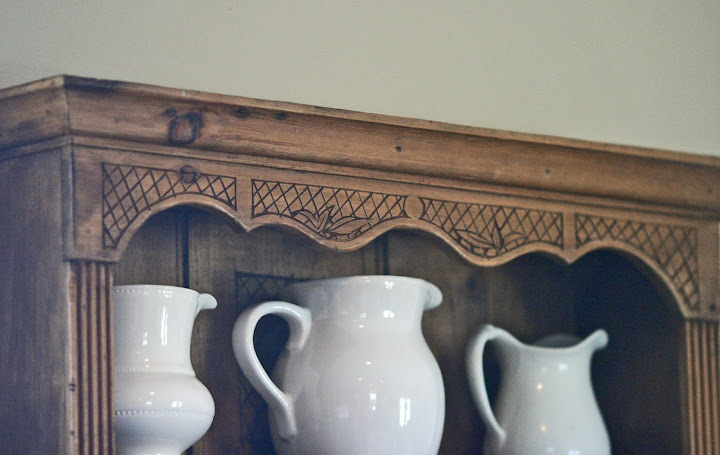 But here is the deal; I knew that if after waxing, I didn’t like the look, I could EASILY paint over it with the Annie Sloan paint without priming or removing the wax. So I got out my Annie Sloan’s dark and clear wax, and mixed them together. 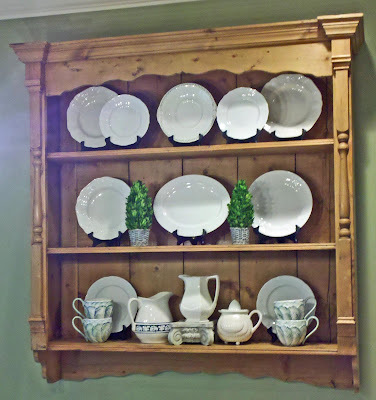 Below you can see the new shelf with the Annie Sloan wax and my new ironstone. It’s a little darker than Caroline’s since I used the darker wax, but it buffed up nicely, I thought. The details on the shelf stand out better now. What do you think? I put the red shelf on the back porch and I think it will be great back there, just as soon as we get it hung. I’ll show pictures later. How wonderful that you found a shelf! I have a link up on my blog in the near future (info is on my blog today) where you can link up about a treasure you’ve found. I hope you will join in – this would be perfect! I love it. My sister has a shelf very much like your friends that I covet, too. She won’t let me have it!! You did great girl! I love it! I think it looks amazing! I just heard about Anne Sloan paint last weekend. Sounds like you’re a believer. As soon as school is out (next week!! ), I’m all over it! LOve it, Anita! I think the wax looks great! Keep it like this for a while and then you can always paint it in the future. Great find! Beautiful shelf! I love it! The shelf looks great, Anita. The wax really livened it up. And I love love all of the ironstone pitchers you “collected” so quickly. I’m anxious to see them in person. Ironstone just sort of grows on you. I think your shelf is perfect. I like how you have waxed it to bring out the details. Your ironstone looks so nice on the shelves!